Captain Mohan Narayan Rao Samant, who passed away Wednesday, had trained Bangladeshi students to sink Pakistani shipping vessels in a covert operation. 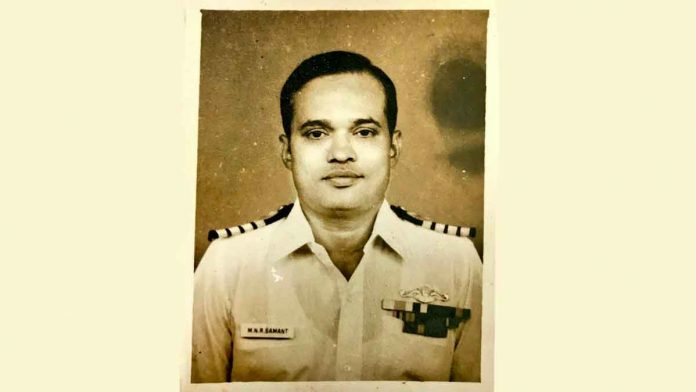 New Delhi: Captain Mohan Narayan Rao Samant, 89, who passed away in a Mumbai hospital Wednesday, was a decorated Indian naval officer who played a pivotal role in the 1971 Indo-Pakistan war. The Maha Vir Chakra awardee was instrumental in India waging a covert maritime war against shipping in the then East Pakistan. He had trained over 400 Bengali college students as maritime commandos for carrying out mass raids and inflicting damages to Pakistani shipping vessels in the run up to the 1971 war. Those who know the war hero closely remember him as a strong-willed individual with a razor sharp memory, a divine singing voice and as a true Navy-man who sailed till the age of 80. Talking to ThePrint, military historian and national security analyst Mandeep Singh Bajwa said Captain Samant’s role was pivotal as it caused heavy losses to the Pakistani military. Senior journalist Sandeep Unnithan, who has co-authored the book Operation X along with Captain Samant, remembers the naval officer as one who could recall incidents with a remarkable precision. The book, which details India’s covert naval war in Bangladesh in 1971, is slated to release in two months, but Captain Samant, who played a major role in the war, was not lucky enough to see the release. Captain Samant was appointed as the commissioning CO of the INS Karanj in 1969. His covert operations began in 1971 when he was an officer attached to the Visakhapatnam-based Eastern Naval Command. Unnithan said that way before the war in December 1971, Captain Samant and his team began training over 400 Bengali college students as maritime marine commandos in April 1971. The commandos were to carry out covert maritime operations inside Bangladesh, then East Pakistan, in support of the Bangladesh government-in-exile. They were trained by a covert naval warfare unit — the Naval Commando Operations (X), NCO(X), set up by Director of Naval Intelligence, Captain M.K. Roy, and navy chief Admiral S.M. Nanda. The training included carrying limpet mines that the trained commandos could swim with on their bellies and plant on Pakistani ships. Unnithan said that over the next few months, the students and eight deserters from a Pakistani submarine were trained for this large maritime covert operation. His role, however, wasn’t just limited to the pre-war period. When the war began, Captain Samant led three gunboats to attack Pakistani vessels on Bangladesh’s Pussur River. “Manoeuvring his Squadron through a most hazardous and unfamiliar route, Commander Samant achieved complete surprise and routed the enemy in Mongla inflicting very heavy losses. Commander Samant then proceeded to attack Khulna to destroy the enemy entrenched in strength in the port,” the citation mentions. This copy has been updated to correct the fact that Captain Samant was the commissioning CO of the INS Karanj in 1969 and not 1971 as earlier reported.